An all-guild show curated by the Art Gallery of Burlington is currently on in the Lee-Chin Gallery until May 24, 2015. The theme is, “The Colour of Water,” and our guild has a juried section in the show. 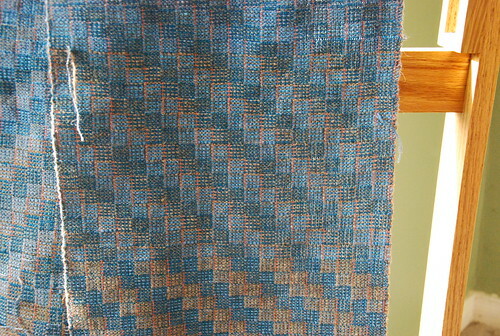 The piece that I have submitted is a handwoven scarf inspired by the confluence of the river as it meets Frenchman’s Cove in Portland, Jamaica. 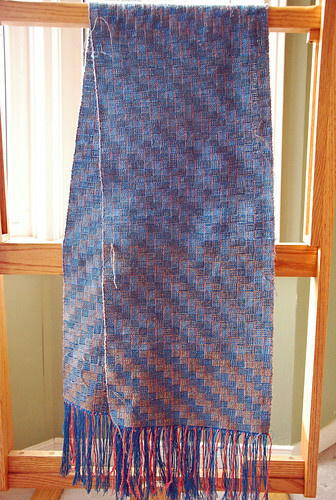 It is a 4-shaft Crackle or Jämtlandsväv structure woven as drawn in with 4 pattern blocks. Planning for this scarf took more thought, materials and calculations than anything I have woven up to now. The colour-blending ability of this classic crackle structure was new to me. In presenting a draw-down for our curator, Denis Longchamps, I was also learning structure myself. It took a full first scarf. To speak cricket, there was a long run up to the crease! The impetus was a copy of Susan Wilson’s book, “Weave Classic Crackle and More” that a weaving friend de-stashed this winter. Her clear explanations & beautiful projects met the blank slate that is my novice brain. Water’s fluidity carried me forward. Nothing was more fun this wretched winter than getting lost in the memory of this place where we swam as children. The warm Caribbean sea mixes, ebbs and flows with the cool river. It is also a place where I have partied as an adult. 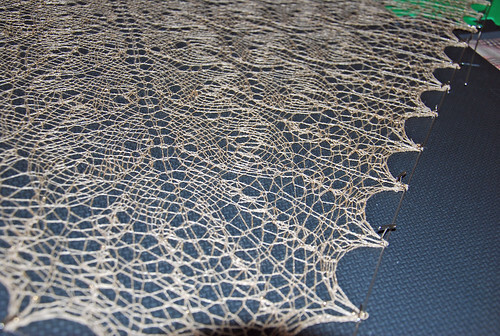 After the trial run (totally wearable), I sleyed, and tied-on for a 13″ wide scarf in the reed. The mystery main warp balanced at 4,075 YPP. In the final piece it is sleyed at 27 ends per inch. Calculations were all for this yarn as 0.8 of the maximum twill sett. The first run helped me learn the sequence for weaving three shuttles at a time, and to get comfortable with my new Glimakra temple. Getting the river’s colour shift from sand to bank was very important. This also improved with my comfort at changing for pattern yarns as well as grounds. Each of the 6 handspun elements in the scarf is from batts made by favourite fibre artists, and spun on spindles by me. The batts are from Enting Fibercraft, Abby Franquemont & Sericin Silkworks. I over-dyed with tea and black walnut to better represent the sand, and river bank. The alternations were planned, and the shifts are not symmetrical although each is woven in the same classic crackle format for 4 blocks. 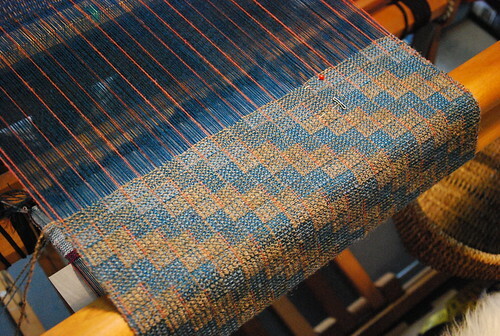 What humbled me the most was how the warp behaved in its second sett. There was far more length shrinkage, and this drove me far closer to the tied ends than anticipated. 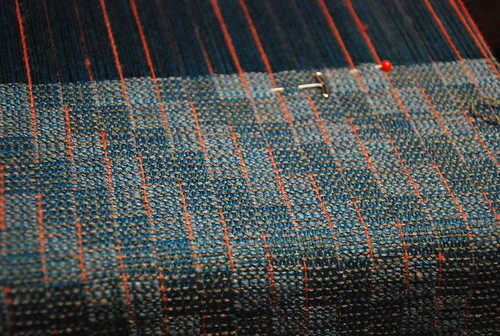 This has been a wonderful stretch into working with colour, and meeting the technical weaving criteria of our guild. No rejection news is good news? The take-in was this past Monday. This “River by the Sea Scarf – colours at Frenchman’s Cove” measures 11.75″ x 59″ with fringe lightly beaded with Toho 8/10 Japanese seed beads. Categories: Finished & in the wide world, Natural Dyes, Spinning, Spinning Guild, Weaving | Tags: Books, Crackle weave, Design, drop spindle, handspun yarn, Jamaica, polychrome weaving, Scarf | Permalink. This past weekend was a high note. It was Sarah Swett’s “The Value of Wool” workshop in Brighton, Michigan. The Spinning Loft brought this talented & prolific fibre artist together with 19 spinners to teach us to use the degrees of lightness or darkness of natural wool in 3 different techniques. It was as far back as January 2010 that I learned about Sarah’s work. I was a new spinner (see the posts! ), and grabbed a copy of America Knits by Melanie Falick from a second-hand book store. Taken back in January 2010, America Knits! Last weekend, I soaked-up every word of How. We were all quite happy. Sitting to my right were Sasha & Beth. We laughed a lot. One of the best things about attending a good workshop is meeting hugely interesting people & seeing friends. There was also She Who Shall Not Be Named. Cracking me up, and taking each joke in style. Handspun colour gradient in the wild! The work path followed an internal logic, and was both highly disciplined, and free-form. We learned to blend 4 colours from a single California Variegated Mutant (CVM) fleece. The pop of white as it leap-frogged to the lightest value from the grey blend was a huge revelation. The degrees of darkness blended far more easily in the 5-steps. Fair isle swatch – when is yardage not my problem? This is an exercise that I will revisit. Having run low on yarn, I couldn’t complete the gradient change as charted. Nor could I cast-off all the stitches! Our second (Second!) task for Saturday was to embroider linen. 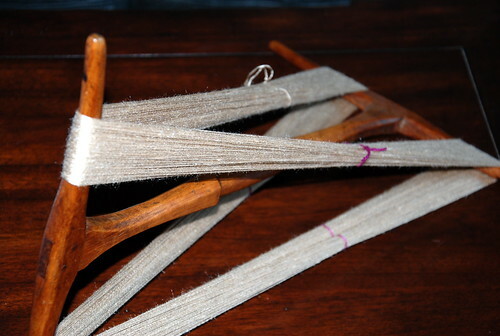 Again we tackled blending but specifically for a smooth 2-ply yarn with aligned fibres. On Sunday, Sarah used the top small tapestry to show how changing the contrasting values affects our perception of an object. Sarah uses cartoons in her tapestry work. She shared that you need to draw the actual coffee stain or splash or else it always looks contrived. The marriage of the comic book form and needle arts tells the reader a story. Quietly embroidering a hummingbird on linen cloth was centering. I sewed its outline during class. 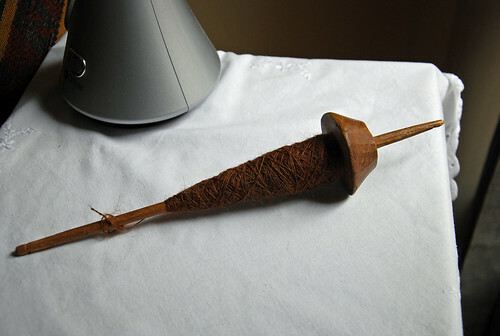 The green satin stitch uses Sasha’s handspun (left on my bobbin), and was homework. All around the room people re-connected with their childhood craft. I did too. Sarah graciously allowed some of us to work outside of the classroom (it was too loud for me). On Saturday evening, Beth had an open house & pizza party for everyone. All of the raw wool is organized! There was spinning, knitting, and lots of stories. Almost everyone came, and it was grand. Beth’s family was especially charming, and you know that I love Maggie! Resisting wool was one thing. Sitting at Beth’s floor loom was another! Her Schacht Mighty Wolf has amazing patina & history coming as it does from Jillian originally. Many thanks to everyone who helped me make the big decision! We got back to work on Sunday with more information about creating mood with fibre & colour. Using our selfies, we all started our needlepoint self-portraits. The exercise was fun, and really instructive. I enjoyed finishing mine at home. N thinks it is a very good representation of President Obama! Frankly, there is no point in making anything unless one is thoroughly attracted both to the subject and its form. There are too many ideas and too little time for anything else. Now, I know how she would sound saying those very words. Thank you, Sarah Swett. May there be many more panic sweaters! 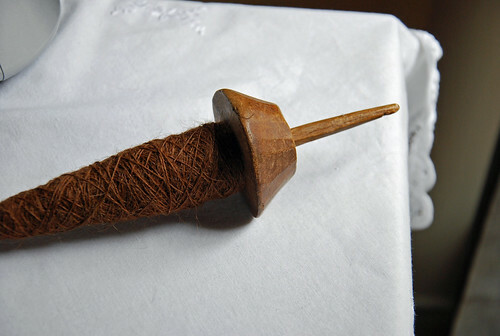 Categories: Fiber Preparation, Getting the knack, Spinning, Weaving | Tags: CVM wool, Design, Equipment, Spinning, Techniques | Permalink. Last year’s push to work with my handspun yarns has really started to bear fruit. I’m excited because there’s now plenty more to share as brand new knits in my life. Back in September, I told you about my Seriously Fun Spin. Weeks later the dyer, Brooke of The Painted Tiger, announced her Fractal Fiber spin-along/ knit-along in the Ravelry group. 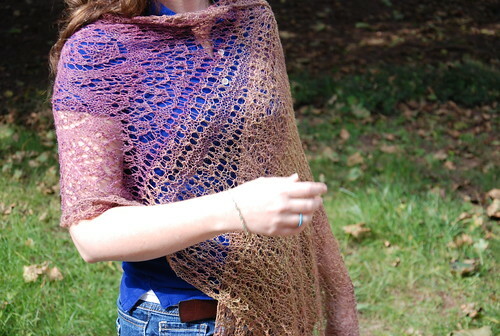 This is Susan Ashcroft’s “very easy but effective” No-Fuss Shade-Loving Shawl. 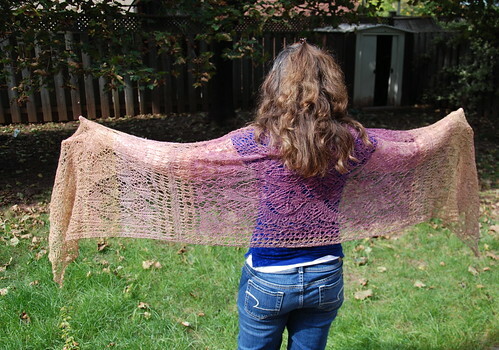 As I quipped on my project page – it’s a fractal-loving shawl! The form (i.e. modifications) followed function. The solid colour bands were on the verge of shifting when I was making the seed stitch lower edge. I sped up the increases (every row), and made Meg Swansen’s edge. It’s charted on page 114 of Knitting Around. Around the same time, I was spinning grey Jacob wool top. This project was all geared towards making purple & grey stranded mittens for this winter. This spin on my Wee Peggy helped me weather more of the medical stuff. Soon, I was wondering why not try to design these mittens myself? Purple: leftover SW Corriedale from my Redhook sweater. My gauge on 2.5mm needles was 15 stitches = 2″. Not many knitting books sit by my beside. “Traditional Scandinavian Knitting” did for ages. It’s full of useful information that doesn’t leap off the page on a 1st reading. Sure, DH was within his rights to declare the cuffs “ghetto” but I am super-proud of this project. One simple idea that grew into its own: I have a pair of warm Jacob mitts! As far back as 2010 this spin shot Shetland to the top of my personal wool list. Moral: spinning triumphs sometimes become an end in themselves. Keep creating. 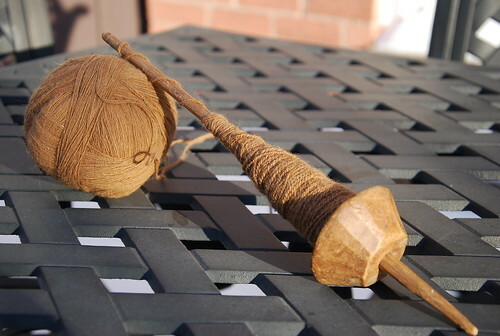 The spark for taking the skeins out of the box was another spin-along/ knit-along on Ravelry. 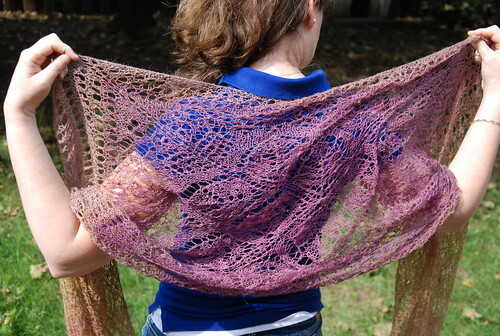 It’s in A Spinner’s Study, and I joined Team Lace – cowl knitting. Aah, my friend, Logwood! This time, I threw some copper liquor into the dye pot. Made from this humble copper scrubbie. I am showing you the cowl first before the group. I gave it diamond lace to match my new mittens. There’s a lot out here about the ‘hows’ and ‘wherefores’ of spinning. What I wanted to show today is why I really spin. Handspun is yarn that gives back to you. Large. Categories: Finished & in the wide world, Getting the knack, Natural Dyes, Spinning | Tags: Books, Corriedale wool, Design, handspun yarn, Jacob wool, Mittens, Ravelry, Shetland wool, triangle shawl | Permalink. Honest truth – I nearly made my baby gift deadline. As my Mother loves to say, “Close but no cigar.” Friends, this is how the saga unfolded… By Friday night, I was almost finished knitting on a garter border. It was a beast of a job but I’d have more than enough time on Saturday to finish her up. I went to my bed, and had sweet dreams. I had botched the upper left corner with misplaced colour changes. So, I ran downstairs, put the coffee on, and had at it. Furious, furious knitting. Does border no. 2 look better? Sure does! Did I have a prayer for finishing? Nope. At around say 1:30 p.m., I knew this would be wrapped on the needles. It was seriously humbling. She is quite possibly the most urban non-knitter friend that I have. There was enough time to unfurl half the stitches onto waste yarn but it probably looked v. strange to her. Especially since she was looking at the wrong side. Good grief! There’s yet more waiting for room to be plied as well! 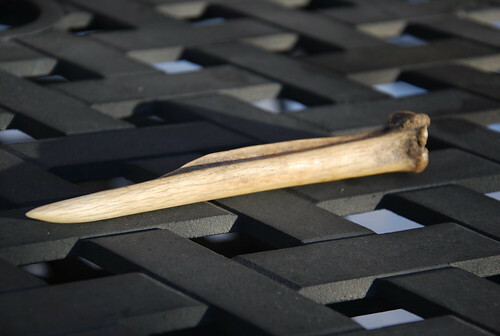 How I think us humans caught onto the idea of spinning in the first place: nature. Categories: In the Pipeline, Spinning, Stash in; Stash out | Tags: Baby gift, Coopworth wool, Design, Flora, Frogging, handspun yarn, socializing | Permalink.